In the last months, Upskillead project partners have implemented ICT courses in Poland, Cyprus, Bulgaria, Slovenia and Italy. Together more than 100 participants had the opportunity to learn more about Online Safety, Graphic Design, Moodle, Social Media, Interactive White Board and Web Design, both in in-house and online courses. 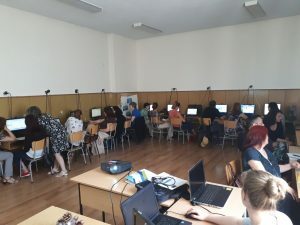 From 2nd- 4th July in Blagoevgrad, Bulgaria, Association Euni Partners has organized intensive ICT training on Graphic Design within the project “UPSKILLEAD: Upskilling Adult Educators for Digital Lead”. During the training, participants got acquainted with basics of Graphic Design, created their own logo, learnt how to use Google Forms or design a business card. After completion of the training, teachers received Open Badge Certificate, which validates their new digital skills.